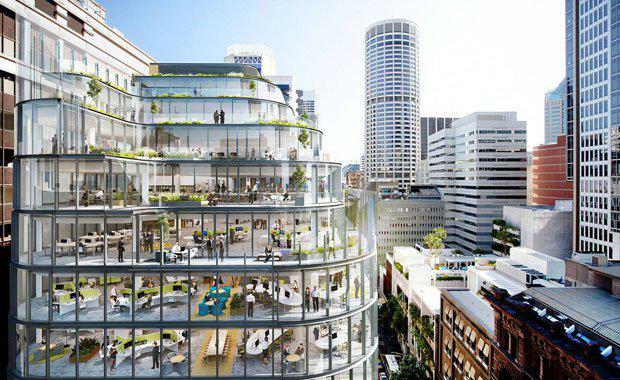 Property group Charter Hall is nearing completion of its new office tower at 333 George Street, Sydney, located on one of Sydney CBD’s most prominent corners, at the heart of George Street and Martin Place. The defining feature central to the building's sense of community is its five levels of cascading rooftop terraces, set within a fully glazed veil overlooking the main thoroughfare of Sydney’s business and lifestyle centre, Martin Place. This space will provide a focal point for occupants of the building, allowing meeting and interaction within a light and airy space. Charter Hall’s Head of Office Property Services, Chris Chapple said, "Our goal is to become the workplace experience provider of choice. This means that we have had to re-think the approach to designing office buildings to ensure we create environments that meet the needs of the modern workforce while remaining functional as a place for business. "333 George Street has been celebrated for its intelligent design, mixed-use spaces that create a diverse and appealing environment and – last but definitely not least – sustainability," he said. The building has been designed to suit contemporary office fit outs and is aiming to achieve a 5-star Green Star (V3 Design and As Built) and a 5 star NABERS Energy Rating. Owned by Charter Hall’s Core Plus Office Fund 333 George Street has been constructed by national construction company Watpac in a deal worth about $72 million. National Australia Bank has committed to a new flagship retail and premium business banking branch in the building as have other retailers, joining many well-known international brands with a strong retail presence in the area. NAB will occupy space across the ground floor and level one of the building and will enjoy direct street access and high visibility to George Street. Sydney Lord Mayor Clover Moore said at the start of construction that, “George Street would regain its historic status as Sydney’s ‘main street’, serviced by clean, efficient light rail, with wider footpaths, trees and places for people to pause and meet. It would be the catalyst for a revival in the whole city centre.